Newly designed for smoother and less problematic usage of the rudder, and designed to raise and lower with one hand in one fluid motion, our new rudder rope system will allow effective rudder use when needed. Handy grab loops of webbing make it easy to used even in cold conditions. 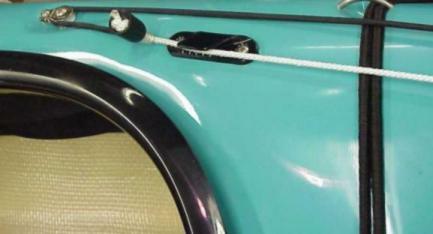 An easy-glide wheel and guided rope holes allow for less resistence in rope movement. A new added cleat now allows the rudder to be held in place (up or down) during transport or in usage.